Yes!...your Mojo is definitely working again, Sylvie. 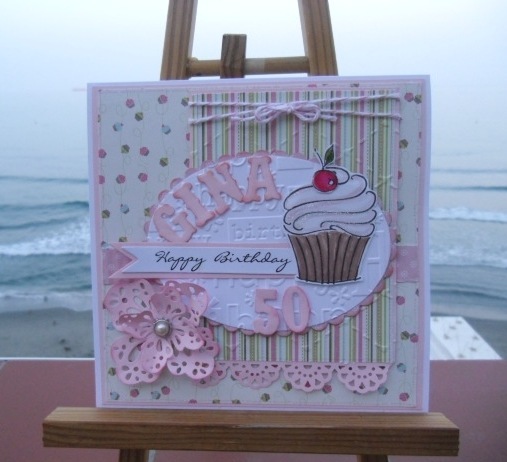 Love your cupcake card with pretty embellishments. Do you remember that song? "I've got my Mojo working...but it just won't work on you" The oldies were the best...they always seem to use them for T.V. Ad's. this is the sweetest card, i adore the pink and cupcake....cuuuute....so glad you played along with us at Mojo Monday! Great Card. New follower. Hope you stop by my blog. I entered a card in this challenge also. Good Luck. I love spending other people's money!!! You have used the cupcake beautifully. Great colour choices and personalisation too. I bet you will use this stamp set loads now!! I think breaks either feed or completely mess up the mojo. But I don't think yours is very far away as this is gorgeous.